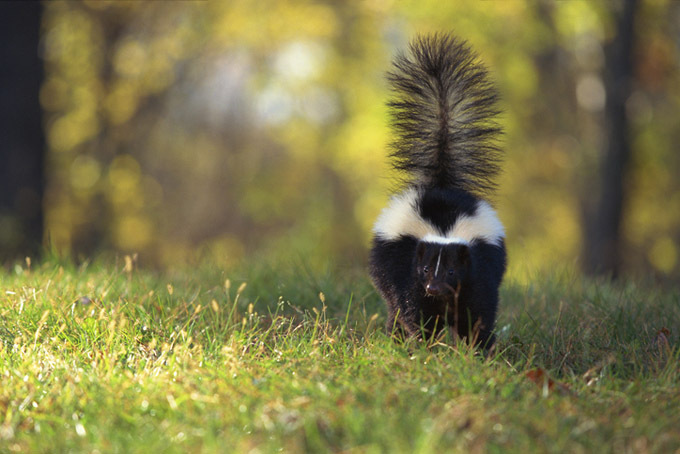 Skunks are adorable creatures that have many ecological functions. Unfortunately, they create one very big problem that most pet owners prefer to avoid: stinky pets. Since the threat that skunks provide isn’t a dangerous one (albeit, highly a unpleasant one), this article will not advocate for some of the extreme methods that are optioned on the internet. 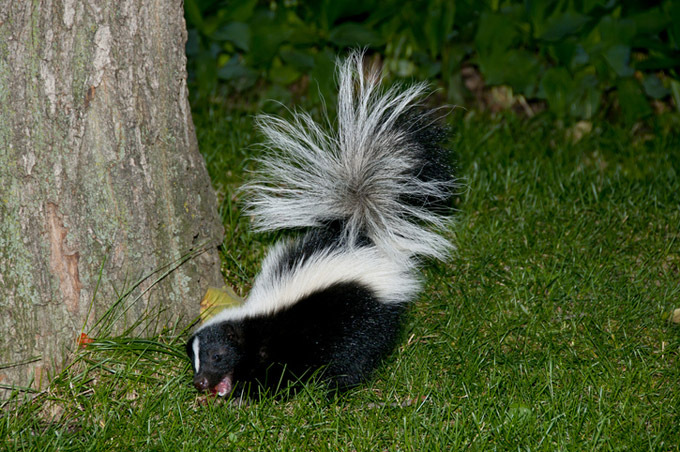 Instead, we will share three ways to keep skunks away from your dog and out of your yard while also keeping children and pets safe from exposure to dangerous chemicals. Before we do though, it’s important to mention the service these critters provide. While the trash leftover by humans is a huge temptation to skunks and other creatures that can be a nuisance, these animals still serve as a means to help keep various pests under control, such as termites, grubs, beetles and beetle larvae, and more. Deterring them from your yard could have side effects you aren’t prepared for. With that in mind, be aware that, despite the encumbrance they pose, each of these animals has a purpose. The next thing is to identify where in your yard they are located. 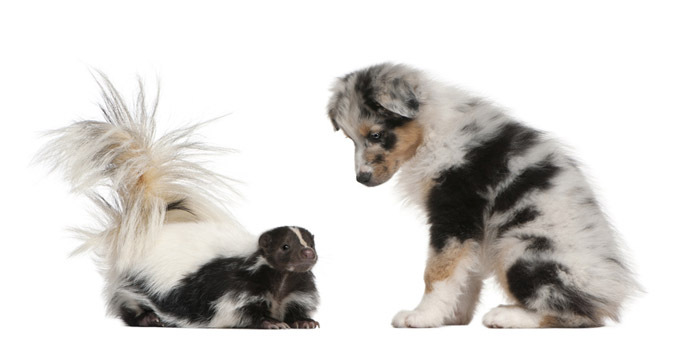 Under decks and sheds are favorite locations of skunks–as well as plenty of other animals. Make sure you apply your deterrents in the appropriate places. While not the most resilient of the options, cayenne pepper is more easily accessible and one of the least dangerous options to get rid of skunks. However, this particular solution will have to be reapplied after rain, as it will wash away. When using cayenne pepper, it is best to also fence off the area once the skunks have left. A cayenne based pepper spray might work slightly better. Add a yellow onion and some jalapeno peppers with a tablespoon of cayenne pepper, then boil together in two quarts of water for twenty minutes. Straining the mixture with a cheesecloth into a spray bottle and applying to problem areas every three to five days after rain will absolutely deter skunks, as they will avoid everything sprayed with this mixture. Usually, dog urine can be enough to deter a skunk as well as numerous other creatures, but sometimes it just doesn’t work as well as we’d like. Upgrading to coyote urine might be a better choice. This and other samples can usually be purchased at outdoor stores. Be advised however that, like the pepper sprays, urine will need to be reapplied regularly. It is best to couple this process with setting up fencing to permanently keep out future pests. Sprinkling these around the skunks’ favorite places, such as den entrances and feeding areas, will also help deter them from returning. Because peels will last until decomposition sets in, you won’t have to apply these nearly as often as pepper sprays or urine, but fencing is still suggested to keep skunks out permanently. Have you tried any of these remedies? What other ways do you keep skunks away from your dog? Let us know in the comments below!